Cambridge Pre-U Mathematics offers a comprehensive resource for students to develop the thinking skills and logic required of the Cambridge Pre-U Mathematics syllabus (9794). 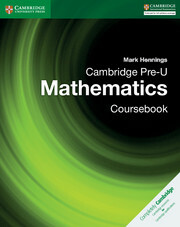 This Cambridge Pre-U Mathematics Coursebook provides a comprehensive resource to prepare students for the high level of mathematical knowledge expected for progression through the Pre-U syllabus. The chapters have been arranged to provide logical progression through the course, and includes clear explanation of concepts, detailed worked examples and focused exercises to help practice and consolidate skills. Detailed exposition of new mathematical concepts, followed by worked examples to help students feel confident. Comprehensive coverage of the syllabus with extension materials marked for students to investigate concepts further. Clearly stated learning objectives to allow students to keep track of their progress. Inclusion of STEP questions in practice exercises with worked solutions to provide students with examples and demonstrations of this type of questioning.